Have you ever seen an aircraft that you would really like to model, but cannot find a canopy suitable for it. This has probably been the cause of many modelling projects never getting past the proverbial sketch on the back of an envelope. I have come across this problem many times in the last few years. In fact, ever since I started to design my own PSS (slope soaring) models. This problem can be solved without spending all the housekeeping money. Vacuum forming is quite simple. All you need is the household vacuum cleaner (ask the wife first), a few lengths of wood (floorboards are ideal), a couple of elements from an electric fire, some piano hinge, a switch and a few other odds and ends from around the house. The illustrations show how my machine was constructed. The size of the unit is entirely up to you. 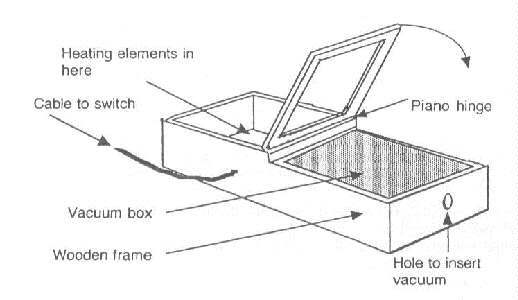 As you can see it is a simple wooden box divided into two sections, one for the heating element and the other for the vacuum. The base on which you place your plug is a piece of chipboard with holes drilled into it (hard work!). The side of the box which has the heating elements in it must be protected from the heat that will be generated. I used thin aluminium. The two elements are positioned inside this side of the box, making sure that they are insulated from the aluminium. I used heat resistant wire to connect up the elements and I would advise you to do the same. The elements should be mounted about 3 inches below the top of the box. The hinge is positioned so that when the lid is flipped over to the vacuum side it lies flat on top of the drilled bed. A strip of rubber is stuck to the lid on this side to make a seal. The lid is usually bigger than the item you are making so a number of aluminium templates can be made to suit the item being formed. There are numerous materials that can be used for vacuum forming, but the more common ones are ABS, PVC, POLYESTER, LEXAN. The best plan is to decide what you are going to make and then ask the advice of the nearest plastics stockholder who will know exactly what material will be most suitable for the task. The next step is to make your original plug. I have tried numerous materials and have found that wood is probably the best medium for the job. Pattern makers use Yellow Pine. This is hard to find and not cheap unless an off-cut can be obtained. The alternatives are normal pine, but some time will have to be spent on getting a perfect finish, otherwise the grain will show in the finished article. The same applies to using balsa, so the choice is yours. If you are just copying an existing canopy, a good method is to just fill the article with fine casting plaster and use that as the plug. Having made the plug you then position it in the middle of the alloy template on the vacuum box, flip the lid over to the heater side of the box and cut a piece of your plastic approximately 20mm larger than the hole in your template and tape down with the tape on the side away from the heat. Switch on the heaters and you will see the plastic sag slightly a second time, then quickly switch on the vacuum and flip over the lid. You should end up with a perfect replica of the item you require, it sounds easy and it is, but there are times when you will use too much heat and a hole appears in the plastic, and also too little heat and the plastic does not pull down to the base of the plug. Try, try, try again - it will be worth it! Chapters include: How to make car bodies, AIRPLANE PARTS, boat hulls and more. Chapters cover; types of plastics, mold materials, heat sources, vacuum sorces, and tips and examples. Unlike other sites, there is NO paid advertising on this site! When you see an ad link, Ken Myers uses and recommends the product(s), supplier or manufacturer. He uses the "stuff" or supplier himself!